Quick overview: How to insert a pre-recorded sound into a SMARTBoard presentation. How can it be used in the classroom? Individual sound files (.MP3, .AIF, or .WAV format) can be inserted into your SMARTBoard presentations. You can link each word (or sentence) to a unique recording of your own voice. When the student taps on the words, they will hear your voice read aloud! This technique works great for language teachers teaching proper pronunciation to their students. If you’d like to know more about how to record your own sound files, please refer to my earlier blog posting on Audacity. 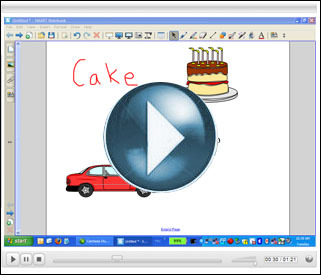 This entry was posted in IWB and tagged inserting sound, SMARTBoard, sounds. Bookmark the permalink. Loved your presentation on presenting sound into notebook. Very concise and clear to understand. Thanks a lot, glad it helped! Wow, I see your e-mail is from Australia. That’s awesome to see I also have teachers reading my blog so far away from Canada! Hi, When you re-click on a picture with a song attached, it plays where it left off. Is there a way to force the player to start at the beginning of the song or sound file? Thanks for your great site and information! I found somewhat of a work around. You’re right, it will continue from the last point played if you clicked on it. As far as I know (99% sure) there is no way to have more control over that feature. However, if you simply leave the slide (i.e – press the up arrow to go back a slide in your presentation) and then return to the slide with the sound or song you were on before, you can click on the object and it starts the sound/song from scratch. Let me know if this helps! Thank you! Fast response and a great answer!